The Folger is too tall to go overland, so we had to ship it to the East Coast through the Panama Canal! 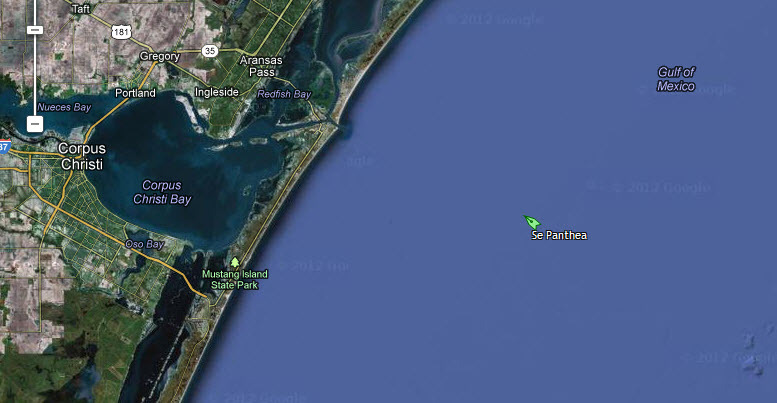 As of August 15th, the cargo ship Panthea is at Corpus Christi, Texas. After unloading cargo there, her next stop is Port Everglades, Florida, where the R/V David Folger finally will be offloaded. Then the Folger’s journey north under its own power begins. Tentatively, the Folger will start up the east coast August 21 or 22, and at that time daily updates will begin. 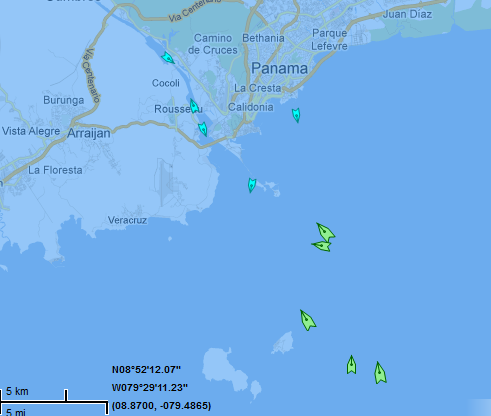 The cargo ship Panthea went through the Panama Canal early this morning. 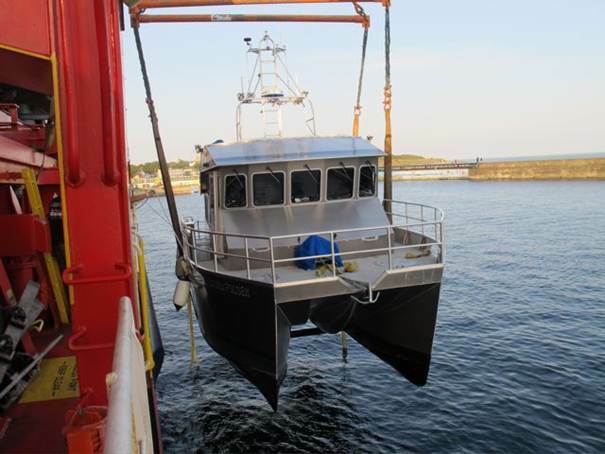 So the R/V David Folger is now in the Atlantic Ocean! The next stop will be Corpus Christi,Texas, and then the Folger will finally go to Port Everglades, Florida for off-loading. The date of its arrival in Florida has been pushed back again and is now scheduled for August 18th. 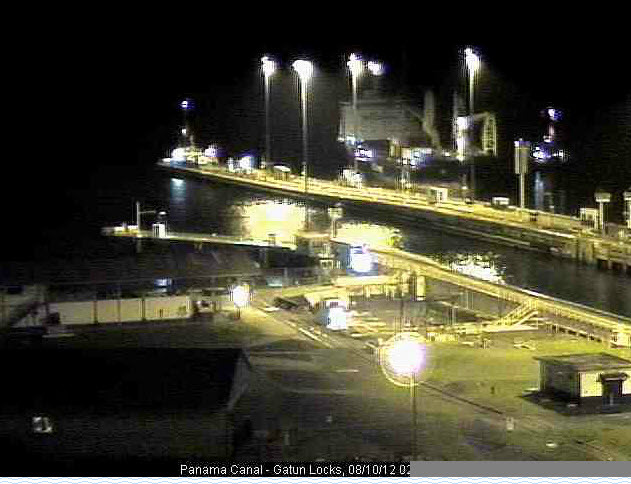 The SE Panthea is awaiting its turn to go through the Panama Canal. 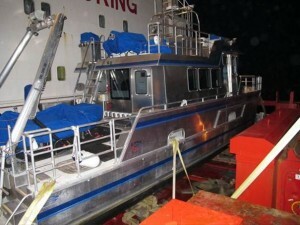 On board this cargo ship is the R/V David Folger. The Panthea is the smaller of the two green ships located just below and to the right of the canal. 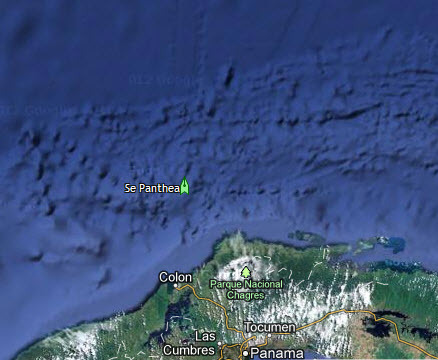 Soon the Panthea will be in the Atlantic and headed to Florida. 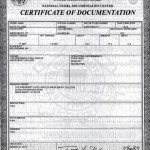 The scheduled arrival date is about August 17th at Port Everglades, FL. Once the Folger is off-loaded, a four-member team (Captain Richard Furbush, Captain Tom Manley, electronics specialist Chris Goodrich, and Mate Pat Manley) will start the journey up the east coast. During our journey, we will do a daily blog update (weather permitting) to let everyone know our position. The R/V David Folger was loaded onto the transport vessel—the cargo ship Panthea—last night and is finally en route to the East Coast! 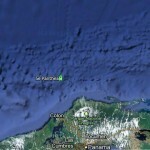 You can track her progress at http://www.marinetraffic.com/ais/ — look for the cargo vessel SE Panthea. 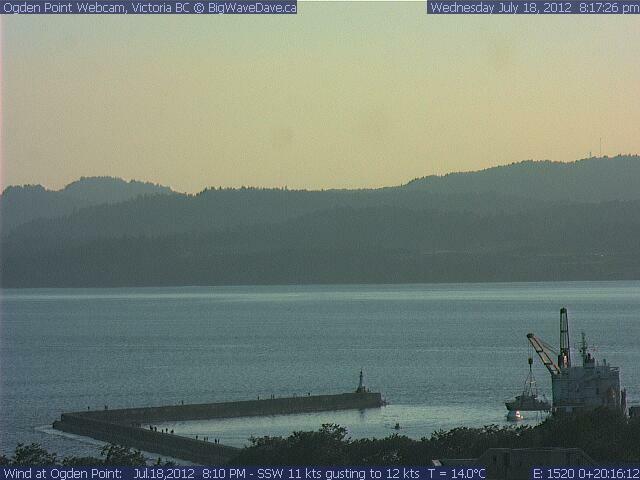 YachtPath has notified us that we load on or around June 9 on Ocean Titan in Victoria. 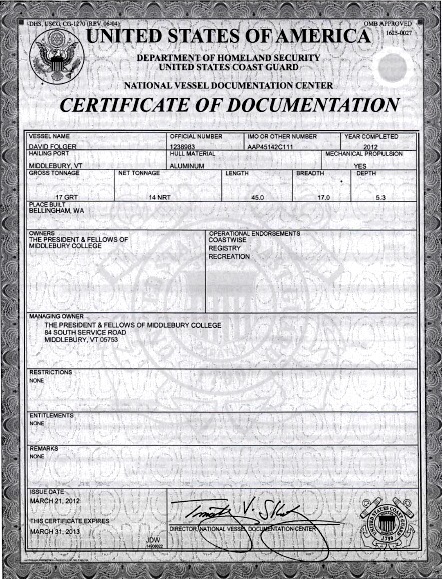 The arrival date in Port Everglades is June 27. 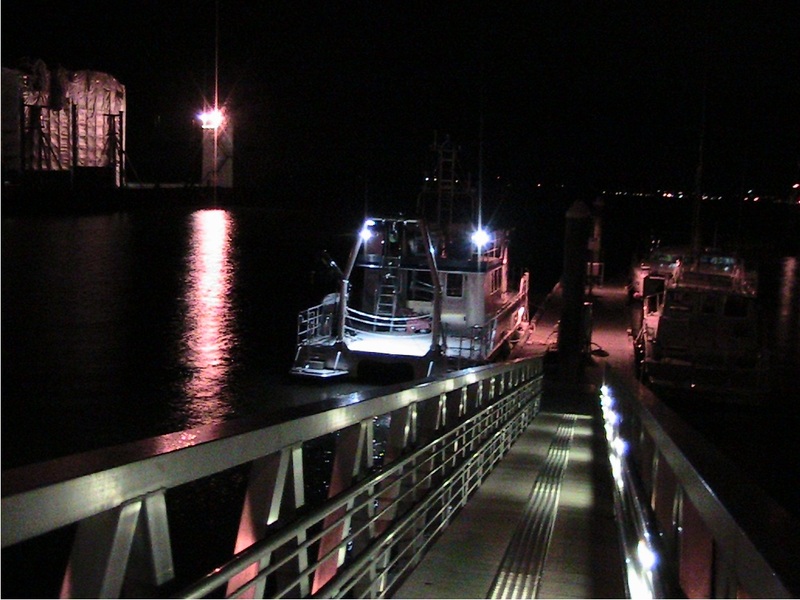 YachtPath will accept the dockage and captain’s fees for the R/V David Folger while it is waiting to load. This week has featured some high peaks… and then abysmal deeps. First, on Monday May 22 Middlebury College took ownership of the R/V David Folger! Since then, Tom and Richard have been getting it ready for transport. And transport is where we plunged into the deeps. 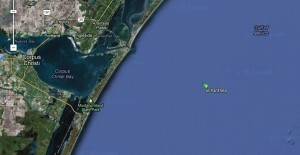 The transport company, YachtPath, does not have a transport ship for us, although they had assured us that they could transport it on Thursday of this week. 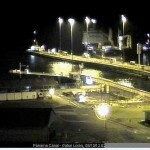 Venezuelan customs was the problem: the ship was scheduled to stop at a Venezuelan port, where no cargo can be offloaded unless customs has looked into the cargo holds. And of course with ships on top of the cargo holds, they wouldn’t be able to do this! 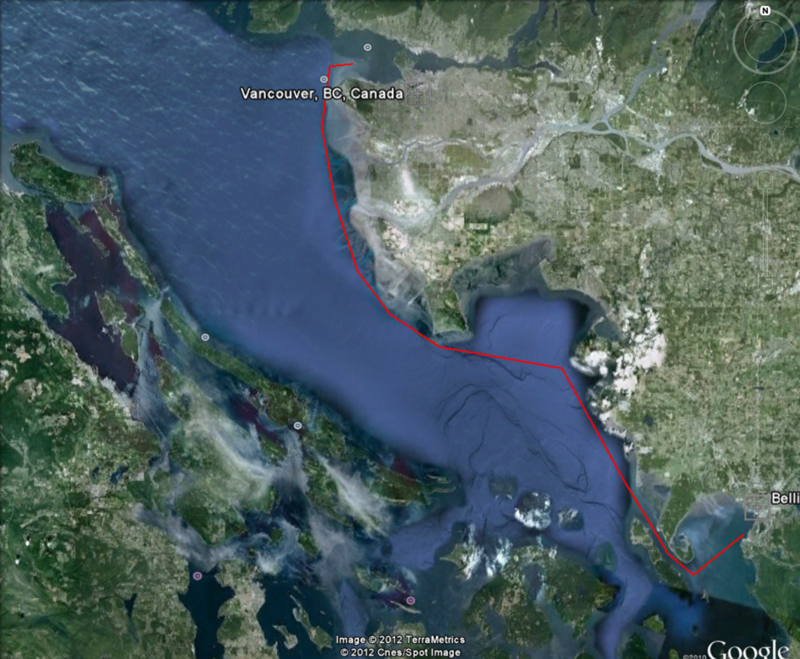 Numerous telephone calls to the president of the company resulted in this arrangement: the Folger is currently underway (under its own power) to Sidney, British Columbia, where YachtPath will pay for it to be held in a marina until the next transport ship is available. The schedule is still tentative; it could be picked up anytime between June 12 and 18. The transport ship, Ocean Titan, is in Seattle waiting for a multimillion-dollar yacht to arrive; then it will come up to Victoria to pick up the Folger and a few other vessels. So the Folger will be riding in style, with very nice neighbors. Unfortunately, this delay affects all summer schedules. Once the Folger is loaded, it will take 20 days to get to Florida. The cruise up from Florida will take another 18 days. Given a June 18th pick-up, it will be July 8th before it arrives in Florida, and somewhere around August 1st when we finally get to Lake Champlain. The Folger will still be here in time for Alumni College and classes in the fall, but this late arrival will severely handicap our research this summer.